Exam Master PANCE and PANRE online certification review. Exam Master offers more than 3,000 questions with feedback and four PA practice exams. These exams can be taken in test or study mode, timed or untimed. Electronic flash cards can also be created to help you study and focus on the topics you need to review the most. This is a great way to prepare for the PANCE or PANRE exam! The cost is only $95 for three-month access. Your three-month subscription begins when you first log-in. Your access expires one year from the purchase date if you never log-in. Donate towards the maintenance of the Stead Center by purchasing a brick or plaque engraved for lasting recognition. 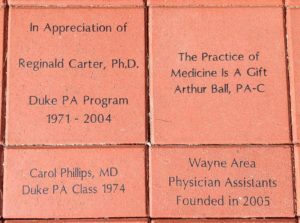 Memorial bricks can be purchased in memory or in honor of a loved one or an individual dedicated to the PA profession. The engraved bricks are displayed at the front entrance of the Stead Center and will last for many years. Bricks can be ordered through our online store. After doing so, send an email to ncapa@ncapa.org and provide the text you would like engraved on the brick. You will be contacted to ensure your brick is engraved correctly. If you prefer not to order online or would like more information, please call 919-479-1995. You can pay with Visa, MasterCard, Discover, American Express or by check.